Here is my new drawing of Kion. 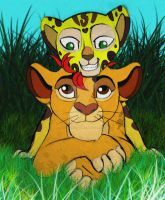 Somehow, when feeling stressed out or worse, drawing The Lion Guard is something that relaxes me and brings me calmness. I absolutely love it. Also, this Kion drawing is my favorite so far. Can you also draw Kiara? Yes, if it's a commission. Cute! Ikr, I always find drawing calms me down! Well, that's only when I sketch, I LOVE TO SKETCH! One of the best lion cubs! Aw, so cute! The detailing is amazing!